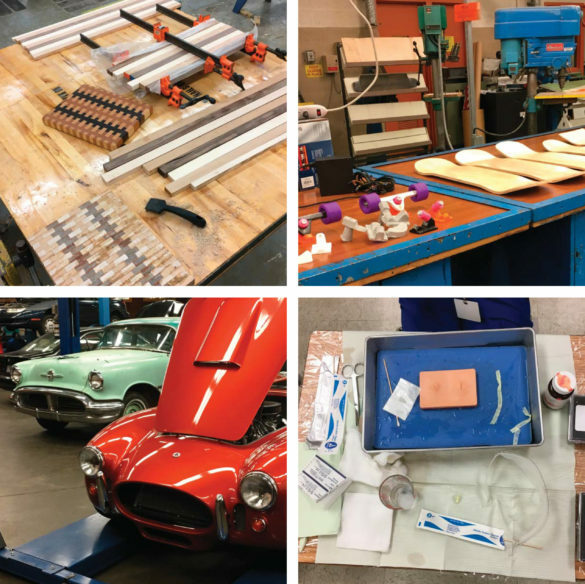 In its 97th year, the Tech Show at Benson Polytechnic High School showcased student work in the Portland magnet school’s majors of arts, communications, health occupations, industry and engineering. As I perused the exhibits and presentations at the late February event, I was awed by the sophistication and breadth of hands-on learning opportunities. This is the high school experience I wish I’d had! Students showed me metalsmithing, skate board engineering, a scale model of the whole school, robots, lasers, light bulb puzzles, full sized kit cars, hand crafted wood furniture, radio programming, chicken breast suturing and wound packing, photography and graphic design. As part of the architectural team which is currently master planning the school’s modernization, I attended the show to better understand Benson’s programs. I left that evening with an incredible optimism for the next generation of innovators. I feel privileged to be designing the exterior collaborative learning environments that will support the technical and artistic endeavors of Benson’s future students.